A few fortunate students are wrapping up their semester in ART 445 / ARC 445 with Prof. John Pinto, focusing on the Rome of Giovanni Battista Piranesi (1720-1778). 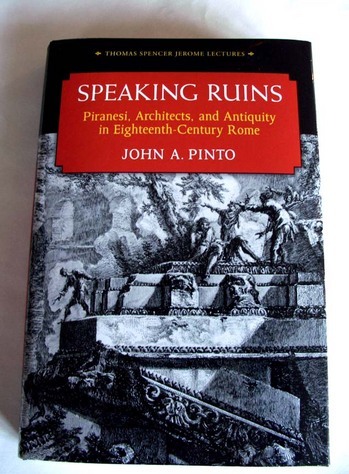 For the rest of the world, you can now have the pleasure of hearing Prof. Pinto’s insights into this fascinating artist and his city, with the publication of Speaking Ruins: Piranesi, Architects, and Antiquity in Eighteenth-Century Rome. 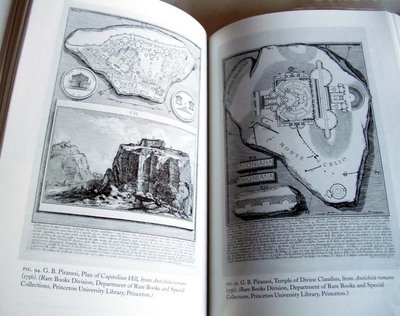 We are especially excited to see the book, as it draws on the Princeton University Library collections (among many other institutions) and our rich holdings of Piranesi’s books and prints. John Pinto is the Howard Crosby Butler Memorial Professor of the History of Architecture at Princeton University. A Fellow of the American Academy in Rome, Pinto’s research interests center on architecture, urbanism and landscape in Rome, especially in the eighteenth century. Among his other publications are The Trevi Fountain (1986) and Hadrian’s Villa and its Legacy (1995), the latter co-authored by William L. MacDonald. Pinto makes extensive use of technology in his teaching, including the Nolli project, an inter-relational database of texts and images linked to a digital version of Giambattista Nolli’s 1748 plan of Rome. John A. Pinto, Speaking Ruins: Piranesi, Architects and Antiquity in Eighteenth-Century Rome (Ann Arbor, University of Michigan Press, 2012).